Magnitude Matters: What if the Fiscal Cliff solution were to actually get us out of this fine tax mess? What if the Fiscal Cliff solution were to actually get us out of this fine tax mess? As mentioned previously, I would like to briefly sketch out an approximation of what a terrifically better tax system would look like. This is a second-best solution since I start with the assumption we need a tax burden so massive as to accommodate a government nearly as massive as the one we have today. If I were asked, "explain taxes to me like I'm a four-year old," I would struggle. Ron Swanson (below) does a decent job striking the emotional chord many of us feel, but this is obviously an emotional appeal designed around the tight confines of satirical comedy. For if it were a comprehensive approach, the tax code would come out looking much worse. Swanson only gets at the raw theft of it all. He leaves out the destructive properties of bad incentives and resources wasted in compliance and avoidance and evasion. If we have to have a taxes, we at least should have them with minimal impact both direct and indirect. Directly we waste resources complying and seeking to avoid. Indirectly the effects are much more severe. By taxing capital, we discourage work, risk-taking, and saving. By taxing consumption, we discourage work, risk taking, and consumption. By taxing work, we discourage work, risk taking, consumption, and saving. Work, risk taking, consumption, and saving are all desirable things. But saving has added desirability as it creates opportunities for more of all the other desirable things. Saving is deferred consumption. The reward for the deferring is more later. So it should be obvious, but sadly is not to too many that taxing (discouraging) saving has a compounding negative effect. Which brings me to my proposal for greatly improving upon this fine mess of a tax system we have. First, we must eliminate all capital taxation (capital gains with its ridiculous long-term/short-term distinction, dividend and interest income, estate taxation, et al.). A flat-income tax would be a big, BIG improvement over were we are today. But we can do better still as this would still be an income tax with the associated negative effect on saving. 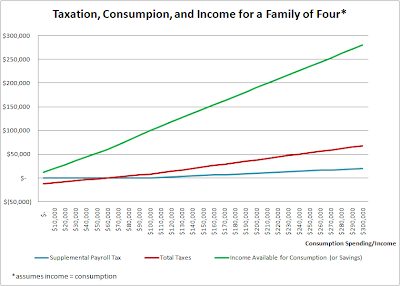 Here is the idea (not at all original to me): tax consumption (a sales tax). Let's assume the rate is 20%. We will apply this rate to the purchase of all final goods and services. Income taxes and payroll taxes (save for a new one outlined below) are gone. No longer will we need to turn in an annual term paper on our income to the IRS. No more manipulations of charitable giving and loss carry forward. No more shelters, loopholes, deductions, exemptions, forms 8166 sub A worksheet nine, math that you never can get to add up to the same total twice. Buy something and a tax is built in (this is preferable rather than being added on after the fact). The business submits sales data and taxes due. Most of this infrastructure is in place already. And notice how little opportunity there is for tax evasion save for the ever-dwindling cash side business. "But what about the poor?" I hear you say. We rebate to every adult the amount of consumption tax that a spending level near the poverty level would imply. Let's target $20,000 (about $5,000 below the official poverty level of income). 20% of $20,000 is $4,000. That amount is payable to every adult American citizen. "But what about poor children?" I hear you cry. We rebate to every adult claiming a unique dependent (someone cannot be claimed twice as with the current regime) some amount of consumption tax an incremental amount of spending would imply. Let's target $10,000. 20% of $10,000 is $2,000. "But what about the 'rich' who are now getting checks from the government?" I hear you shriek. That's where the low-impact payroll tax comes in. I think of it as "low impact" because it will be handled by employers similarly to how they handle payroll taxes now. We will maintain the benefit of not having individuals have to play guess how many toothpicks are on the floor with Uncle Sam. The payroll tax will be a marginal rate of say 10% applied to total compensation (wages and benefits) starting at $100,000 with this threshold indexed to inflation. Notice that it is progressive. Notice that it is straightforward. Notice that it is not of this world . . . yet. Update: Some might ask how housing should be treated: as a capital good excluded from taxation or a consumption good subject to taxation. The answer is it depends but can work well in either case. As a capital good making the assumption (probably a bad assumption, that housing is always an investment), it would be excluded. 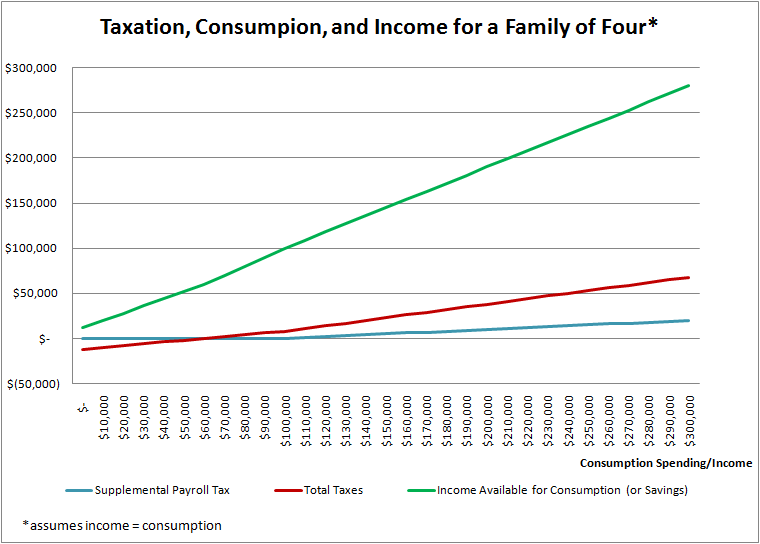 As a consumption good, it would lower the overall tax rate necessary to generate appropriate revenues. The most logical treatment in my mind is to treat any sale or rental of real property as a capital good. Although this increases the tax rate otherwise applicable to consumption, it is a much more straightforward and less manipulable arrangement.